A tax calculation shows your income for the year, your personal allowance, and the resultant tax bill due on the year. *Not all Mortgage Lenders will accept a Tax Calculation from commercial tax calculator software. those that will accept a Tax Calculation from commercial tax calculator software are listed at the bottom of this page. 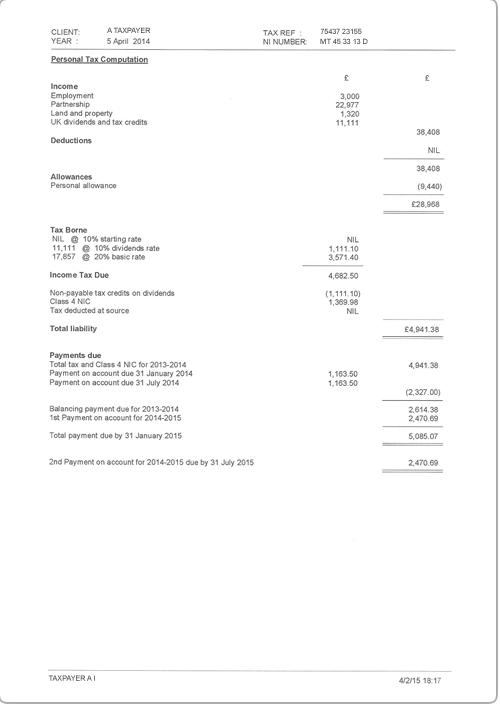 The tax calculation obtained via the HMRC online account is more commonly known as an SA302. **HMRC will no longer post out copies of your SA302 or Tax Year Overview, they stopped this practice in 2017. This is a statement of your tax bill for the tax year, the tax paid, and any amount outstanding. If not, expect your mortgage lender to ask questions. The tax due on the Tax Calculation and the Tax Year Overview should match to the penny (it frequently does not). If the figures do not match, your mortgage lender will query this and insist it is rectified. Therefore, if your figures do not match, have your Accountant address this before you present your Tax Calculation and Tax Year Overview to the Lender. You may need up to three years figures (depending on your Lender) with the most recent set less than 18 months old. Some Lenders will also ask for signed business accounts in addition to your tax calculations and tax year overviews. *Please note that this list (provided by HMRC and dated November 2017) is not, in our experience 100% accurate, if in doubt consult your mortgage broker.